“So I was up til 4 AM hanging out, cutting up audio tracks and winding down from a full day one of Rock and Roll resort. My buddy had crashed in our room and took off in the early AM and I was able to sleep until late morning. The promoters were kind enough to let me into the ballroom where I connected with networked internet and started uploading Friday show audio and my day was started. We ate lunch in the dining room and it was a nice brunch set up, with excellent potatoes, an omelet station and various breakfast treats, coffee, juice and the like. We powered up nicely and got ready for the day. An afternoon nap was successful for my lady, but not for me, I just couldn’t wind down while the music was getting started. I caught up with Creamery Station who took to the lounge beneath the stairs area, I’m not sure what they were calling it. The band came hard and hot and had a big crowd considering the non traditional set up to the spot. 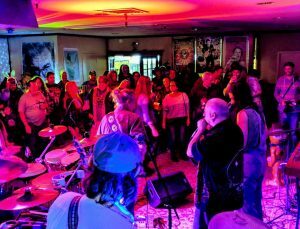 Check out the review of Friday which included sets by Golden Gate Wingmen, Kung Fu, West End Blend, and more.